It's no secret that peak season holidays come with their fair share of baggage, including increased airfare, rocketing accommodation prices and, of course, swathes of like-minded travellers jetting off to sun-kissed beach retreats and exciting city breaks. While you can’t always avoid travelling in high season, you don’t want to tussle with the crowds in order to check in - we've rounded up 8 genius hacks to help you create a savvy travel plan that'll cut the costs and crowds in time for your next holiday. The rule of thumb for planning holidays during peak season is to book in advance to get the best rates for your flights and hotels. But what if you can’t plan your holiday that early? Instead, why not leave things until the last minute and book a little later – you’ll find amazing late deals at rock-bottom prices! Just a week or two before booking dates, airlines, cruise ships and hotels flog cheap tickets to fill their capacity. 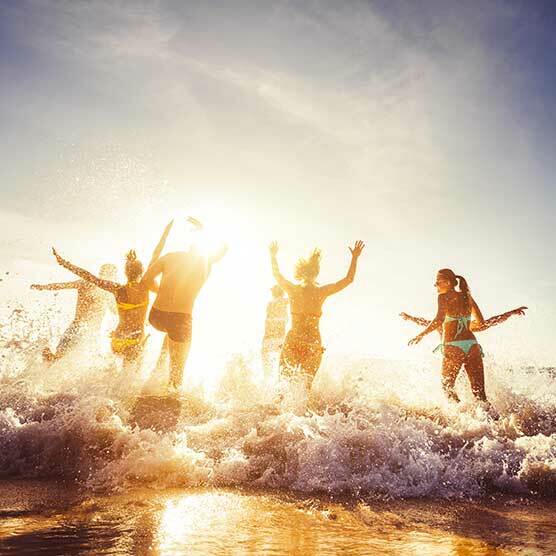 Discover our fabulous range of late-deal destinations and book a last-minute holiday that won’t break the bank, and if you're feeling fancy you can also snap up a bargain by purchasing all-inclusive packages, saving on food and beverage costs while holidaying. Don't be afraid to branch out and discover lesser-known destinations while you're travelling. As you divert away from the touristy hotspots you’re guaranteed to explore unique sights with fewer crowds, making them excellent alternatives to their popular (and often overcrowded) counterparts. Looking for a respite from over-hyped Caribbean resorts brimming with sun tanners? Try Anguilla or St Lucia. Or for a tranquil city break where the hustle and bustle is replaced with an atmospheric old town, labyrinthine cobbled streets and traditional charm, go for holidays to Chania in Crete, Girona in Spain or Talinn in Estonia. For a taste of serene-yet-scenic Turkey, head to Alacati or Urfa. Similarly, give Essaouira a shot instead of Marrakech if you want to experience the colourful souks of Morocco. Exclusive destinations like New York, Amsterdam and Paris can get super-expensive during peak season, but you’ll find a flurry of free, local attractions that'll help you cut down on your travel expenses and that are (quite often) more interesting than their paid counterparts. In New York, you can ride the Staten Island ferry, kayak on the Hudson river, and walk the High Line – all for free! Many museums and galleries in the Big Apple offer free entry on a certain day each month, so you get a dose of culture too. One of the best ways to explore an area is to pack a picnic and indulge in an afternoon of people-watching, find a spot on the green lawns for free, why not head to Jardin du Luxembourg in Paris, Park Guell in Barcelona or Central Park in New York? Or how about taking the free Buiksloterweg ferry in Amsterdam? It's no surprise that the top tourist attractions are abuzz with sightseers during peak season - so if you don't want to get caught up in the crowds, it's best to start your day early. Avoid long queues by setting your alarm a couple of hours earlier than usual and ticking off your favourite spots before the rest of the world rolls out of bed. Customised tours are a great way of exploring the sights with a select bunch of people or check out information surrounding the must-see attractions in advance - they usually have timetables featuring free or reduced entry prices during the week, so you can save some bucks too. Keep your eyes peeled for online travel deals and last-minute packages with great discounts, and the moment you spot a great deal - grab it! Online deals usually last for a few hours, so don’t procrastinate. Before looking for online flights and holiday deals, clear your computer’s browsing history, cookies and cache. Many airlines and travel websites track the number of times you’ve visited their website and change their prices accordingly, so, you can get the best prices by making them think it’s your first time on the site! A good way of keeping updated about online deals is checking the Teletext Holidays travel app, which offers you irresistible deals on last minute holidays, city breaks, relaxing beach holidays and much more! Saturdays and Sundays prove to be popular days for flying - particualrly when it comes to saving an extra day or two of annual leave - but if you want to stay ahead of the crowds then flying out midweek is a must. Not only will you save a lot on flight tickets, but your airport experience will be much quieter and less hectic, too. You're also likely to bag better deals on your hotel stay, as most self-catering accommodations are rented out from Saturday to Saturday. If you want to go the extra mile, you can also consider taking red-eye flights to avoid the madness of peak season holiday rush. You might have to wake up pretty early, but what you get in return are cheap fares and reaching the airport in no time! Why head straight for the hustle and bustle of London’s Heathrow Airport in the height of peak season, when you can catch a flight from alternate, low-key airports instead? Search for alternative options within a radius of 25 - 40 miles that aren't as crowded as big-city ones. What's more, you can even find a cheaper bargain by travelling through smaller hubs, which also offer a more relaxing check-in experience. For example, you can save more and enjoy a hassle-free holiday by flying in or out of Fort Lauderdale-Hollywood International Airport rather than Miami International Airport. Next time you fly out of UK during the high season, try Gatwick Airport rather than the ever-busy Heathrow! Ditch the popular city breaks in dazzling New York or Paris and choose less-expensive destinations that are just as stylish - minus the sky-high peak season prices. You’ll be amazed to know that some of the world’s best holiday destinations are actually the cheapest! Fancy basking in the balmy sunshine on the sweeping golden beaches of Algarve, or looking for a sunny city break in Barcelona with lots of tapas and ruby red rioja? How about snapping some Instagram-worthy holiday selfies while watching glorious sunsets from Santorini in Greece? Portugal, Spain, Bulgaria, Turkey, Cyprus, Malta and Greece are among the cheapest holiday hotspots in the world - better still, you can avoid the holiday crowd and enjoy a relaxing holiday at amazing prices!